Nebulization therapy involves dispensing medication in mist form that is inhaled via the mouth and into the lungs. Such treatment is commonly used for lung issues such as cystic fibrosis, asthma, COPD (Chronic Obstructive Pulmonary Disease) along with several other respiratory diseases or disorders. For nebulization therapy to work effectively, patients need to have the right nebulizer supplies and equipment in place. Such nebulizer equipment would be: Compressors, nebulizers, masks and saline solution all serve as key components that are necessary for helping patients with their treatment needs. 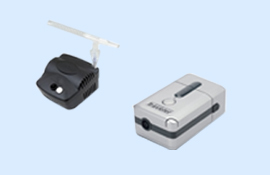 Be sure to purchase your nebulizer equipment and supplies from Medequip. Give us a call.